Where are all the Librarians of Color? 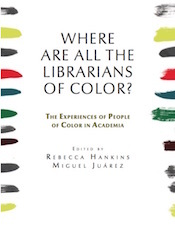 This edited volume addresses the shared experiences of academic librarians of color, i.e. Hispanic Americans, African Americans, Native Americans and Asian Americans. These experiences are very similar and offer a narrative that explains the lack of librarians of color in academia, especially those librarians that have experienced the daunting academic tenure process. This monograph offers a comprehensive look at the experiences of people of color after the recruitment is over, the diversity box is checked, and the statistics are reported. What are the retention, job satisfaction, and tenure experiences of librarians of color? The authors look at the history of librarians of color in academia, review of the literature, obstacles, roles, leadership, and the tenure process for those that endure. What are the recruitment and retention methods employed to create a diverse workforce, successes and failures? Finally what are some mentoring strategies that work to make the library environment less exploitative and toxic for librarians of color? Rebecca Hankins is an Associate Professor and a certified archivist/librarian. She has been at Texas A&M University since 2003. Her previous employment included 12 years as senior archivist at The Amistad Research Center at Tulane University in New Orleans, the premier research repository on Africana historical documentation. Her expertise includes building collections and scholarly resources for the study of the African Diaspora, Race & Ethnic Studies, and Arabic Language and Culture. Miguel Juárez is a doctoral student in the Department of History at the University of Texas at El Paso with over 14 years of academic library experience. He has worked at the State University at Buffalo Libraries, the University of Arizona Libraries, as an Assistant Professor of Library Science at Texas A&M University Libraries, as Head Librarian/Associate Librarian at the Chicano Studies Research Center at UCLA and most recently as an Associate Archivist/Librarian at the University of North Texas. Miguel has been a member of the ALA Diversity Committee and served as inaugural chair of the ALA Diversity Grant. His expertise includes building Latin@ studies collections and Chican@ archival collections.